Celebrating the holiday season with family and friends is something we look forward to all year. No one wants a sore back to be the scrooge of their seasonal festivities. Yet chronic back pain sufferers know that many activities associated with the holidays can aggravate musculoskeletal injuries. Thankfully, with a bit of planning and patience, there are ways to reduce the risks associated with five of the season’s common tasks. Whether you’re going to the forest to cut down a tree (like Clark Griswold in Christmas Vacation), buying one from a lot or pulling an artificial tree from storage, the hauling and hoisting involved in setting it up can provoke existing injuries. The answer: Don’t try to put that tree in the stand by yourself. Get help when you need it. You may also want to take care and pace yourself when adding lights and ornaments. These repeated activities – reaching, twisting, stooping – can add up and leave you feeling it later. The same can be said for stringing lights in the yard or decorating around the house. While joyful, these activities can also lead to reactivating musculoskeletal pain and irritating nerves. Helpful hint: Don’t deck the halls alone. Invite family or friends over, and have them join you in looping lights around the bushes and hanging garland by the fireplace. You’ll avoid the repetitive stretching and twisting that stresses your back, and you might be pleasantly surprised at the results when you include kids in the effort. We all dread holiday crowds at the mall and the grocery store. There’s a lot of walking or standing for extended periods, often while trying to balance heavy bags or packages. It’s an easy way to push your back over the edge. Word to the wise: Don’t overdo it on shopping excursions. Pace yourself between stops – planning a lunch or coffee break is a nice way to give yourself a breather. Go early or late, when there are fewer crowds. You could even mix in some online shopping from the comfort of your favorite chair, too. One of the most common holiday activities is traveling to see family and friends. Whether you go by plane, train or car, travel can be tedious – carting luggage around, standing in lines and sitting for extended periods. Tips for taking it easy: Be prudent when packing to keep your bags as light as possible, and ask a seat neighbor for assistance stowing luggage. To further avoid back strain, bring along your own lumbar support. Giving yourself plenty of time to get through ticket and security lines and sending gifts ahead of time are other great ways to reduce strain. 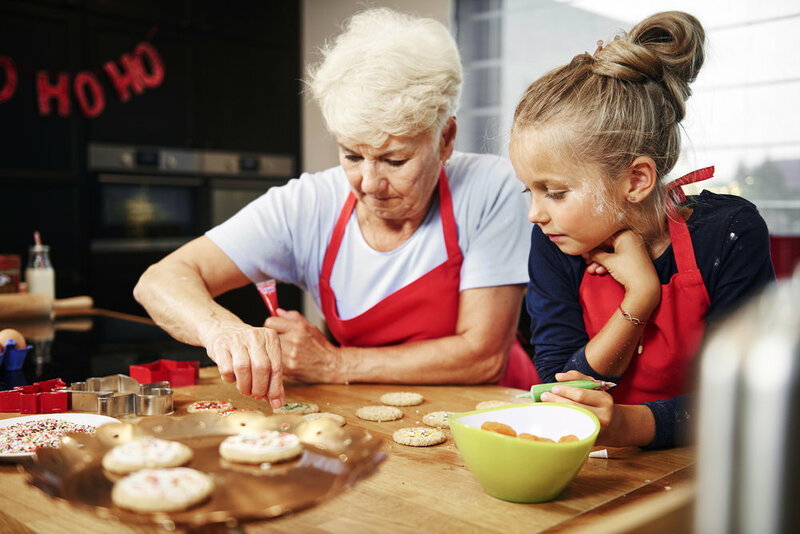 Special meals and desserts make for some of our favorite holiday traditions, but standing and stirring for hours in the kitchen can be a perfect recipe for back pain. Bright ideas: Wear comfortable, supportive shoes and maintain good posture. Take regular breaks so you can stretch your back, shoulders and neck. If you’re hosting a party or dinner, plan to do as much as you can ahead of time to spread out the workload. Where possible, do your prep work in a chair to reduce the amount of standing. It’s easy to get carried away during the holiday season, but make sure to save some time for you. Fight the temptation to abandon regular exercise routines. If you can’t fit in your normal stretching routine, consider splitting exercise up into smaller chunks of time throughout the day. Planning extra breaks to breath and relax will help ensure you stay pain free. If you do end up overdoing it during the holidays, be proactive about getting relief. Have your heating pad, ice packs or electrotherapy unit ready so your symptoms don’t get worse. Or, better yet, treat yourself to a massage or a session with your preferred health care provider – like a physical therapist, chiropractor or acupuncturist. Some pampering will leave your body thanking you later. What are your favorite tips for staying pain free during the holidays? When is a Spinal Cord Stimulator Implant the Right Choice?